April 5, 2011 – Lufthansa has selected Pratt & Whitney PurePower PW1100G engines for its order of 30 aircraft in the A320neo family. The order approved by Lufthansa’s supervisory board on March 16 still requires contract closure with Airbus. The agreement between Lufthansa and Pratt & Whitney represents 60 PW1100G engines for the aircraft fleet with deliveries scheduled to start in 2016. Pratt & Whitney is a division of United Technologies Corp.
“We are very pleased with the improved fuel efficiency, noise reduction and environmental benefits of the A320neo family aircraft with the PurePower PW1100G engine,” said Executive Vice President Lufthansa Group Fleet Management Nico Buchholz. “We have spent a lot of time with Pratt & Whitney to thoroughly understand the Geared TurboFan architecture, and we are convinced that the engine will deliver significant benefits.” Each Lufthansa Airbus A320neo family aircraft will be powered by two PurePower PW1100G engines with benefits including double-digit reductions in fuel burn, environmental emissions, engine noise and operating costs when compared with today’s engines. The PurePower engine uses an advanced gear system allowing the engine’s fan to operate at a different speed than the low-pressure compressor and turbine. The combination of the gear system and an all-new advanced core delivers fuel efficiency and environmental benefits. A320 New Engine Option (NEO) Airbus has been working on offering a new engine for the A320 known as the New Engine Option (NEO). The choice for new engines include the CFM International LEAP-X and the Pratt & Whitney PW1100G. The new engines will burn 16% less fuel; the actual fuel gain on an A320 installation will be slightly less, since 1–2% is typically lost upon installation on an existing aircraft. This means an additional range of 950 km (510 nmi), or 2 t (4,400 lb) of extra payload. The A320neo will also include some modifications to the wing, mainly the installation of blended winglets called "Sharklets". Pratt & Whitney first attempted to build a geared turbofan starting around 1998, known as the PW8000. This essentially was an upgrade of the existing Pratt & Whitney PW6000 that replaced the fan section with a gearing system and new two-stage fan. After several years of development the PW8000 essentially disappeared. Soon after the ATFI project appeared, still using the PW6000 turbomachinery but with a new gearbox and a single-stage fan. This led to the Geared Turbofan (GTF) programme, which was based around a newly designed core jointly developed with MTU Aero Engines of Germany. 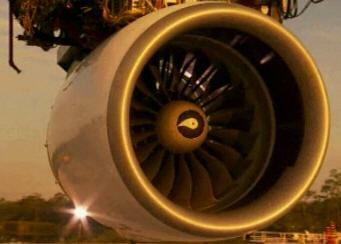 In July 2008, the GTF was renamed the PW1000G, the first in a new line of "PurePower" engines. Pratt & Whitney claims the PW1000G is 10% to 15% more fuel efficient than current engines used on regional jets and single-aisle jets, as well as being substantially quieter. The engine was tested on the Pratt & Whitney 747SP, and the second phase of flight testing for the PW1000G was conducted on an Airbus A340-600. The testbed aircraft, with the engine in the number two pylon position, flew for the first time in Toulouse on October 14, 2008. Testing of the PW1524G model began in October 2010. Final versions are expected to be in production in 2013.